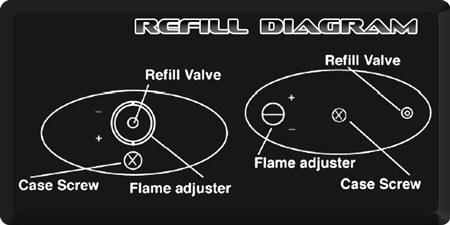 A general guide to refilling your Vector® brand lighter. 01 Make sure no open flames are near. 02 Adjust flame height to low setting. 04 Shake refill can to check for butane gas. 05 Hold both the refill can and the lighter upside down in each hand. 06 Push refill nozzle firmly, and all the way into the lighter valve. 07 Fuel in position for 15-20 seconds. 09 Reset flame height from low flame to desired setting. 05 Insert the butane gas cylinder vertically into the filler valve.